You need to add the coach checklist to a pathway for it to be assigned to a learner. The coaching step will be automatically added to a new pathway, with the coach set to one of your Admin groups by default. 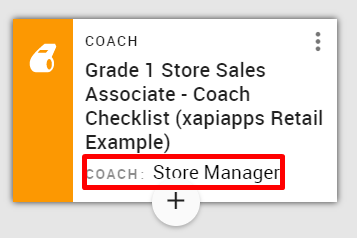 In this example it has added Store Manager as the default group. Step 6: Change the coach if you want. Step 11: Search and select for the learner(s) you want to assign the coaching to. Step 12: Click OK to assign to the learner(s). You can view a list of people you have assigned the pathway to if you click History. How does the coach checklist app work?